Justin has now completed the restoration/conversion of the GE TV, and it looks great! So an old TV cabinet has reassumed the role of a functioning home electronic that will bring many years of enjoyment. 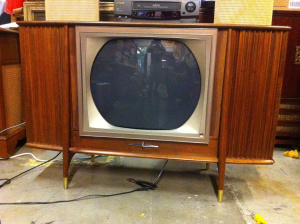 If you have an old TV you love but doesn’t work reach out to Justin to see about a conversion. Let this conversion show you the thoughtful care he takes to make these TV’s look original. Thanks again Justin! Saw this at the store yesterday. Was positively stunned with how gorgeous it is! I wanted to ask it for it’s autograph! Amazing! Thanks Vic, we’ll have a party at our house when we’re done unpacking so you can see it in person.